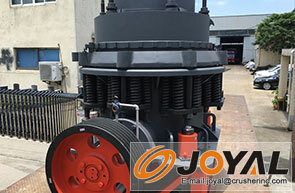 The JOYAL ZYS Cone Crusher is a high-performance model optimized and improved on the basis of PY Series Spring Cone Crusher. 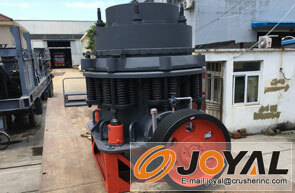 The ZYS Cone Crusher is widely used for secondary and fine crushing in the fields of mining, building materials, metallurgies and so on. 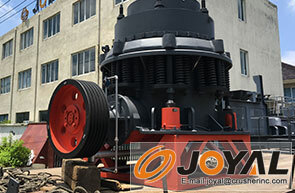 The ZYS Cone Crusher can crush materials with middle and high hardness, such as, metal ore, basalt, granite, limestone, cobblestone, sandstone and so on. 1. Customers can choose suitable crushing chamber of each model according to the material feature, fineness of the end product and particle size requirement. 4. Equipped with long crushing arm to ensure huge stroke, strong crushing force, and high capacity. 5. Hydraulic cleaning system keeps the cavity clean, and it’s easy to operate, thus reducing the stoppage of machines. 6. Reliable performance, low investment, and long service life of quick-wear parts. 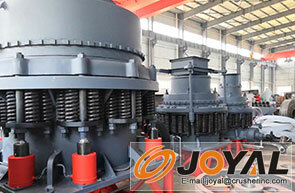 During the operation of ZYS Series cone crusher, driven by the electric motor ,the eccentric shaft bush will rotate with the triangle belt, small and big bevel gear, big bear, transmission shaft .Driven by the eccentric shaft bush ,the cone crusher axis will move circularly . ,which makes the mantle close or leave the cone from time to time .And then the materials will be crushed by continuously compacting, striking, and crooking in the circle crushing cavity between the fixed and moveable cone. 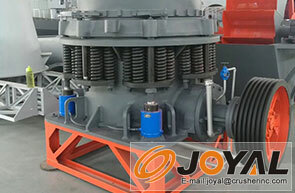 After several times’ repeating, the materials will be crushed to the required size and then they will be discharged by the discharging opening.